Donald Trump’s lawyers want Stormy Daniels to pay almost $800,000 in legal fees and fines, in the aftermath of her failed defamation lawsuit against the president. Daniels filed the lawsuit in April, and the suit was tossed out in October by the federal judge presiding over the case, who found that Trump’s tweet about Daniels which kicked off the lawsuit was “‘rhetorical hyperbole’ against a political adversary” that is protected under the First Amendment. Judge S. James Otero also ordered Daniels to pay Trump’s legal fees. Politico reports that Daniels has appealed the decision. 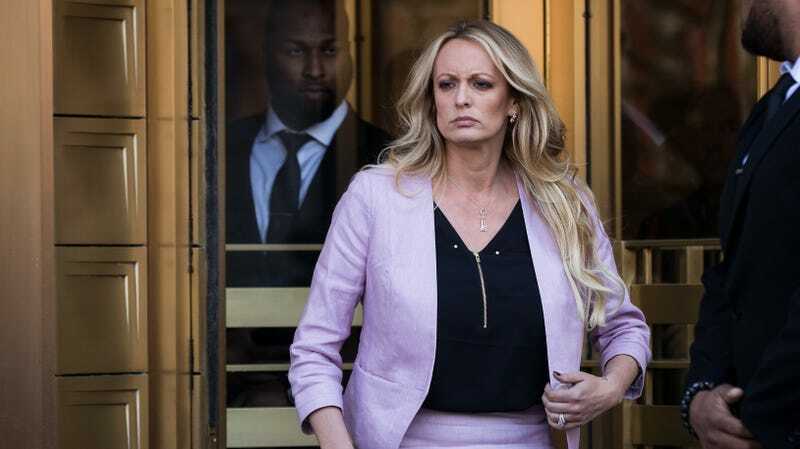 Just one week ago, it seemed that Daniels felt some regret over the lawsuit as well as her association with Avenatti, who remains under investigation by the Los Angeles Police Department over a domestic violence allegation. At the end of November, Daniels told the Daily Beast in a statement that the defamation suit was filed by Avenatti against her wishes. She also said that Avenatti started a second crowdfunding site to help pay for her legal expenses without her approval (that fundraising site appears to have been taken down) and that he “repeatedly refused to tell me how my legal defense fund was being spent.” Avenatti responded that he has “always been an open book with Stormy” and recently tweeted out what appears to be an account of his expenses. But it appears that they’ve made up! Meanwhile, a separate lawsuit Daniels and Avenatti filed against her former attorney as well as Trump’s former attorney Michael Cohen is ongoing.